Learn how to make chocolate caramel cookies. What a great flavor you will find in these cookies! I always plan to have several cookie recipes among my Christmas cookie recipes containing some form of chocolate. If not, family and friends will be very disappointed. Chocolate is one of the most popular foods around the world. Chocolate is found in candy recipes, cookie recipes, cake recipes, drinks and even in gravy recipes under the name “mole sauce”. This ingredient is so versatile and blends with many other ingredients to make delicious desserts. It is available in so many different forms which add to the perfection of each dessert. When I learned how to make chocolate caramel cookies I love the delicious flavor of chocolate and caramel. You just cannot get any better partnership than these two. 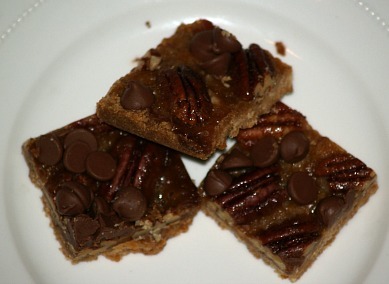 In many recipes there is the added bonus of pecans or other nuts. This is what has made the turtle recipes so popular over the years; turtle cookies, turtle candy, turtle cheesecakes and many more. Beat together the sugar, butter egg yolk, milk and vanilla in a small bowl until well blended. Combine the flour, cocoa and salt and blend into the butter mixture. Refrigerate for a couple of hours until firm. Beat the egg white slightly. Shape the dough into 1 inch balls. Dip the balls into the egg white and then roll balls into the chopped nuts to coat. Place on lightly greased cookie sheets about 1 inch apart. Press thumb gently in the center of each ball. Bake 10 to 12 minutes or until cookie sets. In a small saucepan combine the caramels and whipping cream. Over low heat, cook and stir until caramels are melted and mixture is smooth. After removing from the oven, press the thumbprint again. Spoon about ½ teaspoon of the caramel filling into the thumbprint. Remove cookies to a wire rack to cool. Melt the chocolate chips and the 1 teaspoon butter in the microwave or double boiler until smooth. Drizzle chocolate over the cookies. Although these caramel brownies are not chocolate caramel cookies, it combines the same delicious flavors in brownie form and I know you will love them. To make brownie melt over low heat in a medium saucepan chocolate and butter, stirring constantly until smooth; remove from heat. Add vanilla, eggs, sugar and brown sugar; blend well. Stir in flour and pecans; mix well. To make topping heat chocolate, butter and milk in saucepan over low heat stirring until smooth and chocolate has melted. Remove from heat and stir in vanilla and powdered sugar until smooth; pour over the filling and spread to cover. Refrigerate for 30 minutes before cutting into bars; store in refrigerator. I learned how to make these chocolate caramel cookies called Turtle cookies. Combine and mix well flour, butter and brown sugar; pat firmly in ungreased 9 X 13 inch baking pan. Sprinkle pecans halves evenly over the crust. Combine over medium heat butter and brown sugar; cook until sugar has melted and it begins to boil. Pour mixture evenly over crust; bake about 20 minutes or until caramel layer is bubbly all over. Remove from oven and immediately sprinkle with chocolate chips; slightly swirl chips and let cool. NOTE: This cookie is like a crunchy, caramel brittle candy on a crust. Cut while still warm or if you wait until cold I pry entire sheet loose; place bottom side down on cutting board and cut into squares with a large sharp knife. These cake mix cookies are easy to make with a box mix; the brickle chips give the flavor of caramel. Combine first three ingredients stirring well; press mixture into bottom of 9 X 13 inch baking pan. 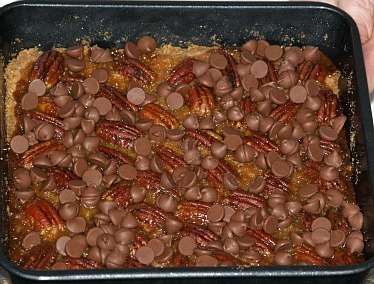 Combine brickle chips, condensed milk and pecans; spread over crust. Bake 25 minutes; remove from oven and let cool before cutting into bars.